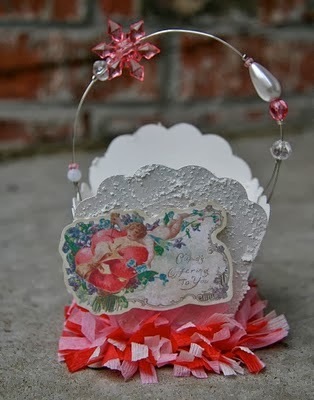 Here's an adorable paper basket using a popular image from our Vintage Valentines collection. After I had the basket with the blue angel sitting on my desk for a couple days, I got to thinking that these baskets would make good Teacher's gifts for Valentines Day! To make this basket more in line for Valentine's Day, I used pink, white, and red streamers at the bottom of the basket. I also used pink and white beads on the handle. Click through to see the full post and link to a tutorial. I have chosen what i want. But i cannot find a way to purchase it. Please help me. How can it be this hard to buy.